Count Buffon, one of the leading scientists of his day, ridiculed the climate, animals, and Indians of North America. Seldom have Americans cherished European writers who refused to praise our country as lavishly as we felt they should. But in the long and blustery chronicle of American touchiness over criticism from abroad, few episodes are more charming than the campaign launched by Thomas Jefferson against a pack of dastardly foreign scientists who claimed that the New World's weather was cold and soppy, that our mammals were puny, and that our Indians were shiftless sissies. This late-eighteenth-century defamation of the Americas was spread by various naturalists and popularizers of science, both Continental and British. But what gave the slanders their aura of respectability was that they originated and found their most eloquent expression in the pages of the august and formidable Count Buffon. 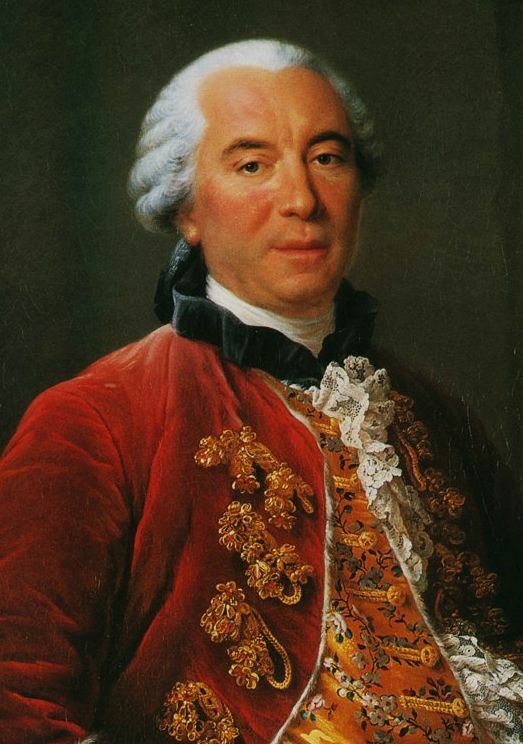 Nowadays, Georges Louis Leclerc, Comte de Buffon (1707-1788) rates an inch or so in the quotation dictionaries for having said that “the style is the man”; yet it would be a chore to name a scientist between Newton's day and Darwin's who was more widely known and admired by his contemporaries. Buffon's grand opus, the Histoire Naturelle, Générale et Particulière, stretched to 44 volumes. New editions, translations, and abridgements appeared frequently during the author's lifetime and for decades after his death. As late as the 1860's George Bernard Shaw laughed to overhear a pompous gentleman in a Dublin bookshop inquiring for "the works of the celebrated Buffoon"; for, as Shaw would later recall, "Every literate child at that time knew Button's Natural History as well as Aesop's Fables." Buffon was regarded as one of the luminaries of the Enlightenment: an intellect ranked with Diderot, Montesquieu—even Voltaire. He was Superintendent of France's Royal Botanical Gardens and of her Royal Museum. He was one of the "Forty Immortals" of the French Academy and a member of every important scientific society in Europe. When this emperor of natural history decreed America to be dank and nasty, who could say how many thousands of potential emigrants or investors might grow wary of the New World? In America, Nature is “weaker, less active, and more circumscribed in the variety of her productions,” wrote Buffon, who had never visited the New World. Buffon never crossed the Atlantic. But then, we can hardly blame him for shunning a hemisphere whose wretchedness he understood so well. The transpiration of so many vegetables, pressed close together, produces immense quantities of moist and noxious exhalations. In these melancholy regions, Nature remains concealed under her old garments, and never exhibits herself in fresh attire; being neither cherished nor cultivated by man, she never opens her fruitful and beneficent womb. Here the earth never saw her surface adorned with those rich crops, which demonstrate her fecundity, and constitute the opulence of polished nations. In this abandoned condition, every thing languishes, corrupts, and proves abortive. Snakes, lizards, toads, spiders, and insects were fond of America, reaching such huge size that one wonders how they managed to squeeze through all that vegetation. 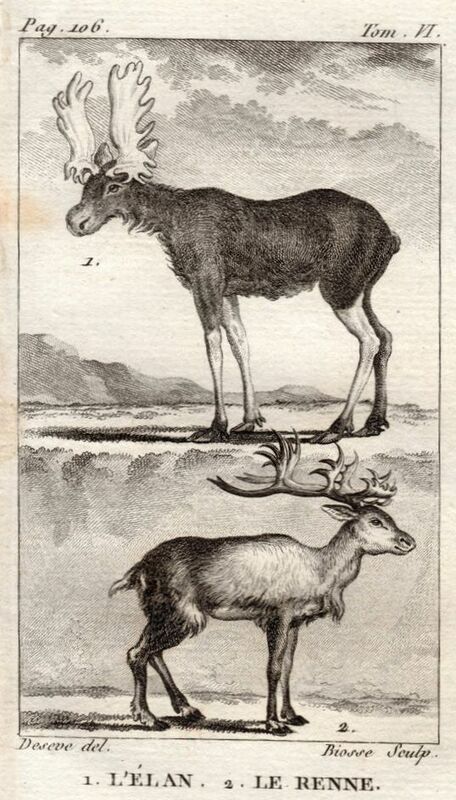 Buffon had a rather imprecise knowledge of the relative sizes of moose and reindeer, among other facts about North America. On the other hand, the higher animals could never flourish in such an icebox, for Buffon held that they grew largest and strongest where it was hot and dry. Horses, oxen, sheep, hogs, and dogs were smaller in Canada than in France. Even worse was the plight of donkeys. Buffon conceded that in Brazil and Peru they multiplied as eagerly as in Europe, but in Canada donkeys could not reproduce: "The cold seems to deprive them of that vigor of constitution, that natural ardor, by which, in warm climates, they are so much distinguished from other animals." The true tiger is a terrible animal, and perhaps more to be dreaded than the lion himself. His ferocity is tremendous; and we may judge of his strength by his size, which is commonly from four to five feet high, by nine, ten, thirteen, or fourteen feet long, without comprehending the tail . . . . These characteristics are sufficient to distinguish the tiger from all the carnivorous animals of the New World, the largest of which scarcely exceed the size of our mastiffs or greyhounds. The leopard and panther of Africa and Asia are not nearly so large as the tiger, and yet they are much larger than the rapacious animals of South America. . . . In Buffon's judgment, what was true of the cats was no less true for all of America's native mammals. The New World's closest match for the elephant was that pitiful beast the tapir, which "exceeds not the size of a calf of six months old, or of a very small mule." And as for such Old World monsters as the rhinoceros, the hippo, the camel, and the giraffe, Buffon felt obliged to point out that America had brought forth no creatures whatsoever to compare with these. In America . . . . animated Nature is weaker, less active, and more circumscribed in the variety of her productions; for we perceive . . . that the number of species is not only fewer, but, in general, that all the animals are much smaller than those of the Old Continent. . . . In this New World, Nature seems to have operated upon a smaller scale: man alone has been copied after the same model. Buffon made it clear, however, that only in sheer bulk could a New World man possibly be deemed the equal of (say) a Frenchman. Indeed, for Buffon America's Indian was a most ignoble savage--a doubly sad case in that he was both a victim of the climate and a secondary cause of it. The Indian was partly to blame for the New World's miseries because he had been too stupid and lazy to drain the swamps and clear the land for farming. Having failed so abjectly to exercise man's rightful dominion over the earth, the Indians "existed as creatures of no consideration in Nature." They were merely "a kind of weak automatons, incapable of improving or seconding [Nature’s] intentions. " The savage is feeble, and has small organs of generation; he has neither hair nor beard, and no ardor whatever for his female; although swifter than the European because he is better accustomed to running, he is, on the other hand, less strong in body; he is also less sensitive, and yet more timid and cowardly; he has no vivacity, no activity of mind; . . . he will rest stupidly upon his legs or lying down entire days. Because the Indians lacked sexual urges, all their feelings remained stunted: "Their heart is icy, their society cold, and their rule harsh. . . They have only few children, and they take little care of them." Buffon was far too genteel to spell out the logical corollary of his theory—that European man also degenerated when exposed to America's terrible climate. That insult was left for his disciple, the Abbé Guillaume Raynal. "One must be astounded," quoth the astounded Raynal in his book on the West Indies, "that America has not yet produced one good poet, one skillful mathematician, one man of genius in a single art, or a single science." ...he got on his favorite theory of the degeneracy of animals, and even of man, in America, and urged it with his usual eloquence. The Doctor at length noticing the accidental stature and position of his guests, at table, "Come," says he, M. l’Abbé, let us try this question by the fact before us. We are here one half Americans, and one half French, and it happens that the Americans have placed themselves on one side of the table, and our French friends are on the other. Let both parties rise, and we will see on which side nature has degenerated." It happened that his American guests were Carmichael, Harmer, Humphreys, and others of the finest stature and form; while those of the other side were remarkably diminutive, and the Abbe himself particularly, was a mere shrimp. He parried the appeal, however, by a complimentary admission of exceptions, among which the Doctor himself was a conspicuous one. For Jefferson, the grace and elegance of Franklin's swift thrust were easier to admire than to imitate. His own major defense of his hemisphere was to be solid, earnest, and thorough; and it was to be directed principally at Buffon. 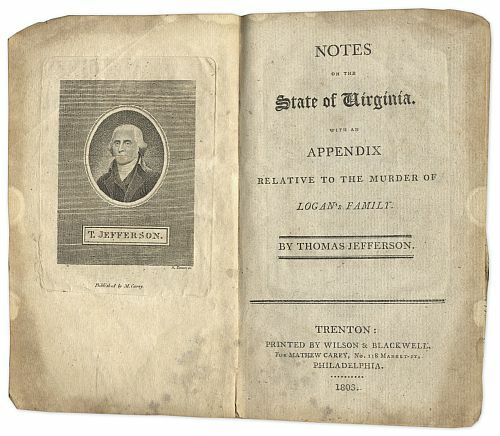 Notes on the State of Virginia began as Jefferson's response to a set of "queries" addressed to every state governor by the Marquis de Barbé-Marbois, secretary to the French legation at Philadelphia during our Revolution, when France was eager to gather information regarding her new ally. Jefferson drafted his replies to Marbois in 1781, shortly after his gubernatorial terms ended. Soon thereafter, he began to enlarge his "Notes" to book length; but he did not publish until 1785, when he was serving as our minister to France. The Notes on Virginia are, of course, much more than an annihilation of Buffon. A minor Enlightenment classic, the book is a compendium of information, insights, predictions, philosophical speculations, and Jeffersonian horse sense. But the attack on the theory of New World degeneracy is by far the longest section, and it is probably the section to which Jefferson devoted most care. Asserting that Buffon deserved "immortal honor" for having written that he loved any person who corrected him when in error, Jefferson proceeded to make himself very lovable. The "Notes" assail Buffon's position from every side. Jefferson casts doubts on the premise that moisture retards growth and on the notion that America is colder than Europe. He disparages the travelers whose books Buffon had trusted: "Was natural history the object of their travels? Did they measure or weigh the animals they speak of? or did they not judge of them by sight, or perhaps even from report only?" I have seen a hog weigh 1050 lb. after the blood, bowels, and hair had been taken from him. Before he was killed an attempt was made to weigh him with a pair of steel-yards, graduated to 1200 lb. but he weighed more. Yet this hog was probably not within fifty generations of the European stock. His defense of the Indians includes tributes to their ardor and parental love; praise of their courage in battle and stoicism under torture; and--as one proof of their sensibility and intelligence--he includes a speech by Logan, a chief of the Mingos, which Jefferson judges to be as moving as any passage in "the whole orations of Demosthenes and Cicero. " In war we have produced a Washington, . . . whose name will triumph over time, and will in future ages assume its just station among the most celebrated worthies of the world, when that wretched philosophy shall be forgotten which would have arranged him among the degeneracies of nature. In physics we have produced a Franklin, than whom no one of the present age has made more important discoveries, nor has enriched philosophy with more, or more ingenious solutions of the phenomena of nature. We have supposed Mr. Rittenhouse second to no astronomer living: that in genius he must be the first, because he is self-taught. . . . Here Jefferson cannot resist mentioning that France has over six times our population, and asking if she can exhibit half a dozen Washingtons, Franklins, and Rittenhouses. Taken in its entirety, Jefferson's refutation is imaginative, cogent, and overwhelming. Beneath a thin veil of eighteenth-century decorum and Virginia good breeding, his paragraphs throb with patriotic indignation. 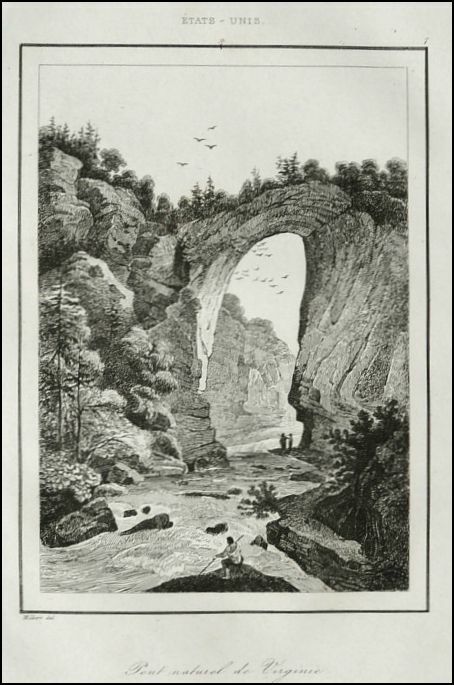 Jefferson was so fascinated by natural science that he purchased the Natural Bridge in southwestern Virginia, depicted in an 1837 engraving by Firmin Didot Frères published in Paris. The saga of Jefferson's moose might be called an appendix to the assault on Buffon in the Notes on Virginia—an afterthought by a man who could not leave well enough alone when the good name of his part of the world was at stake. If the learned Buffon, who was so enamored of comparing sizes, sincerely believed the European reindeer to be the same creature as our moose—why then, would it not be both gratifying and instructive to offer the Count a modest token of one's regard? By March of 1784, Jefferson had aroused the enthusiastic interest of General John Sullivan of New Hampshire, who wrote to say that he was working hard at procuring a moose skeleton. But the General's exertions proved unsuccessful that year, and when Jefferson embarked for France (July 1784) his luggage included no gift for Buffon except a large panther skin he had chanced upon in Philadelphia. Although he saw to it that Buffon was presented with one of the first copies of Notes on Virginia, the two men did not meet until Jefferson had been in Europe over a year. In December of 1785 the busy diplomat finally got around to sending off the complimentary panther. On New Year's Eve Buffon returned a note of thanks, which included a dinner invitation for any evening of Monsieur Jefferson's convenience. The readiness with which you undertook to endeavour to get for me the skin, the skeleton, and the horns of the Moose, the Caribou, and the Orignal or Elk, emboldens me to renew my application to you for those objects, which would be an acquisition here, more precious than you can imagine. Could I chuse the manner of preparing them, it should be to leave the hoof on, to leave the bones of the legs and of the thighs if possible in the skin, and to leave also the bones of the head in the skin with the horns on, so that by sewing up the neck and belly of the skin we should have the true form and size of the animal. However I know they are too rare to be obtained so perfect; therefore I will pray you to send me the skin, skeleton and horns just as you can get them, but most especially those of the moose. The winter proved extraordinary, much snow but no Crust till the Last of March, at which time a Crust happening he sallied forth with his forces and with Difficulty killed one in Vermont State and transported. his Carcass to my House agreable to orders. He was no less than 14 Days with a Team in The Transportation. . The remaining flesh began to be in a state of putrefaction. . . . The Horns of the Deer, the Elk and the Caribou I also send. [The Moose horns] are not the horns of this Moose but may be fixed on at pleasure. The horns of those animals are not in perfection at this season of the year. . . . The Skeletons of the other Animals, though they might be procured with Less expence, I could not think of hazarding it without your consent. These animals are generally taken far in the woods and very often, as was the Case with this, Twenty miles from any road. A way must of course be cleared through the wilderness to transport them whole and halled by hand, to some common road. . . Beyond Sullivan’s account, we must rely on our imaginations to suggest what the good captain and “his forces" endured in that late winter wonderland. It's apparent that those doughty hunters were neither summer soldiers nor sunshine patriots, but surely there must have been moments aplenty when they wished they had kept snug by their hearths and left the honor of the New World to fend for itself. In the next weeks Sullivan wrote several times to Jefferson: once to send the hefty bill; once to announce that Captain Pearce's sailing delay had given him the chance to tuck another set of horns into the crate; . . . and finally to report that Captain Pearce had managed—"either through Accident or Design"—to sail off and leave the moose behind. Undaunted, Sullivan hastened to add that he had already found a new means of conveyance. Those were days of tedious, labyrinthine trans-Atlantic mails, and Jefferson's first hint that the Great Moose Expedition had taken place was a note from Sullivan received July 18. All it reported was that because bills drawn on France were finding no market just then, he had billed Jefferson indirectly for 46 pounds by drawing on John Adams' secretary in London. When he honored the debt, Jefferson could only guess that his costly purchase was a moose in a poke; and hope that eventually it would arrive. In mid-August he wrote to inform Sullivan that if the bill was for a moose and if the carcass had miscarried, he "would decline repeating the expence or giving your Excellency the trouble of a second sample." Jefferson had given up the crate for lost when, around September 30th, it finally wafted into Paris. I am happy to be able to present to you at this moment the bones and skin of a Moose, the horns of [another] individual of the same species, the horns of the Caribou, the elk, the deer, the spiked horned buck, and the Roebuck of America. They all come from New Hampshire and Massachusets. I give you their popular names, as it rests with yourself to decide their real names. The skin of the Moose was drest with the hair on, but a great deal of it has come off, and the rest is ready to drop off. The horns of the elk are remarkeably small. I have certainly seen of them which would have weighed five or six times as much. . . .
“I am happy to be able to present to you at this moment the bones and skin of a Moose," Jefferson wrote to Count Buffon. Thus did Jefferson leave the celebrated Buffoon to answer his conscience, with all his grievous errors on his head and a shedding moose on his hands. In America the war had only begun. The Notes on Virginia were taken as a call to arms, and from the later 1780's until well into the next century our presses and speakers' platforms rang with denunciations of European prejudice and exaltations of New World vigor and fecundity. Everyone from Rembrandt Peale to Alexander Hamilton to Robert Fulton took his turn at lambasting Buffon and all his tribe. In the preface to The Sketch Book (1819), Washington Irving says that one reason he had traveled to Europe was to see the great men there, who were reputed to be to America's great men "as a peak of the Alps to a highland of the Hudson. . . . I will visit this land of wonders, thought I, and see the gigantic race from which I am degenerated." As for Thomas Jefferson, when did that indefatigable spirit ever wholly drop a subject which engaged his energies and curiosity? In his last years Jefferson still delighted to recall that long ago vindication of the New World. When Daniel Webster arrived in 1824 to pay the 81-year-old Sage of Monticello a visit, he heard about the panther skin and the horns. Perhaps Jefferson also told him how neatly Dr. Franklin had disposed of the shrimp Raynal. And the moose—of course Mr. Webster must hear the story of the moose. The old man’s memory played a few tricks on him, but the nub of the story was what mattered, and that there was no forgetting.